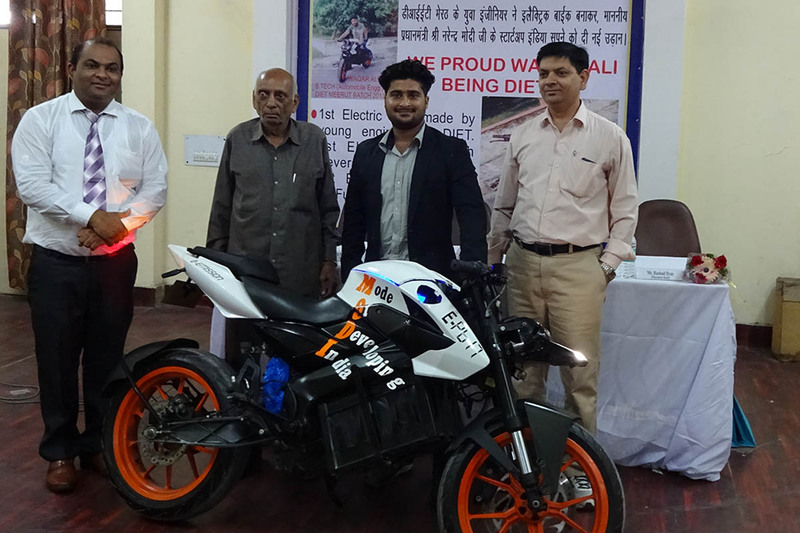 “Mode of developing India” is an “Electric Bike”.................... which is driven with the help of the battery thereby shifting away from conventional fuels to electricity. 1. With the aim to help the physically disabled people who face problems while taking the vehicle out of the parking, this bike is fitted with a reverse gear with some modifications in the existing mechanism. 2. It not only uses electricity but can also work with solar energy thereby reducing its operating cost. 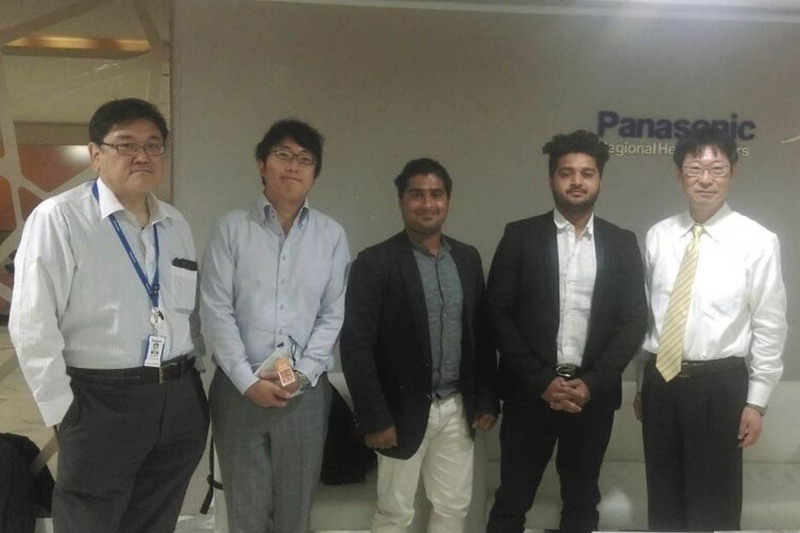 In today’s world robotics is a fast growing and interesting field. Autonomous Intelligent Robots are robots that can perform desired tasks in unstructured environments without continuous human guidance. 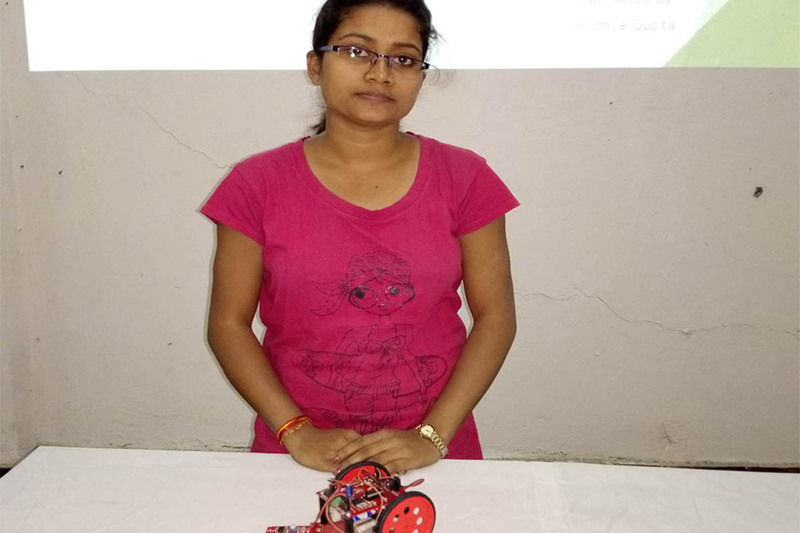 The project is designed to build an obstacle avoidance robotic vehicle using ultrasonic sensors. 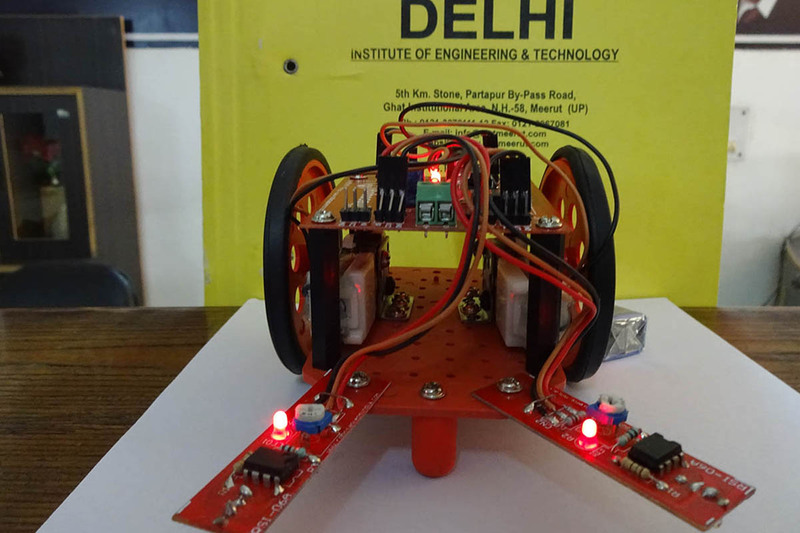 The robot is made using ultrasonic sensor and it is controlled by Arduino microcontroller. The data is taken from the surroundings through mounted sensors. The sensor can sense the obstacle and deviate its path to choose an obstacle free path. The data is sent to the controllerwhich then decides its movements. We have programmed the controller with ANDROID app.Computational intelligence involves the programmed instructions. The ultrasonic sensor is one of the best technique which is used to sense the obstacles. The Ultrasonic sensor module “HC-SR04” works on “Echo” concept which is something you get when sound reflects back after reaches the surface. The travelling time of ultrasonic waves is 343m/s. This much of speed is meticulous for MCU’s in microcontroller to measure accurately. Practically the waves reflect back from the surface located 4 meters away in 15 ns. The ultrasonic wave does not affect the humans. The ultrasonic sensor is mostly used for distance measurement application. These sensors are able to detect the barriers present in front of them. Ultrasonic sensors generate sound waves with higher frequencies that humans cannot perceive, making them ideal for quiet environments. They do not consume much electricity, are simple in design, and are relatively inexpensive. Wall structure plays important roles in supporting the superstructures, separates spaces in buildings into sections and delineates a space in open air. Most of the construction of house in India use bricks and mortar which consists of cement, aggregates and water as the materials to build the structure of wall. However, cement and bricks manufacturing process will contribute to a high emission of carbon dioxide (CO2) which may lead to global warming. Therefore, objective of this project is to find an alternative solution to reduce this environmental problem. The alternative way that can solve the problem is by replacing the use of bricks in building construction by plastic bottles filled with sand as we called it plastic bottle green house. Reuse of these non-biodegradable plastic bottles not only can solve the environmental problem, but it can also reduce the pollution. The main concern of this project is the strength of bottle bricks. Eco-house also known as Green building, is the creative buildings and supportive infrastructure that reduce the use of resources, create healthier living environments for people, and minimize negative impacts on local, regional, and global ecosystems Green building also has been studied at United State (U.S. Department of Energy, 2010) it shows that the annual impacts of building construction including 35% of carbon dioxide production which is a major contributor to global warming. 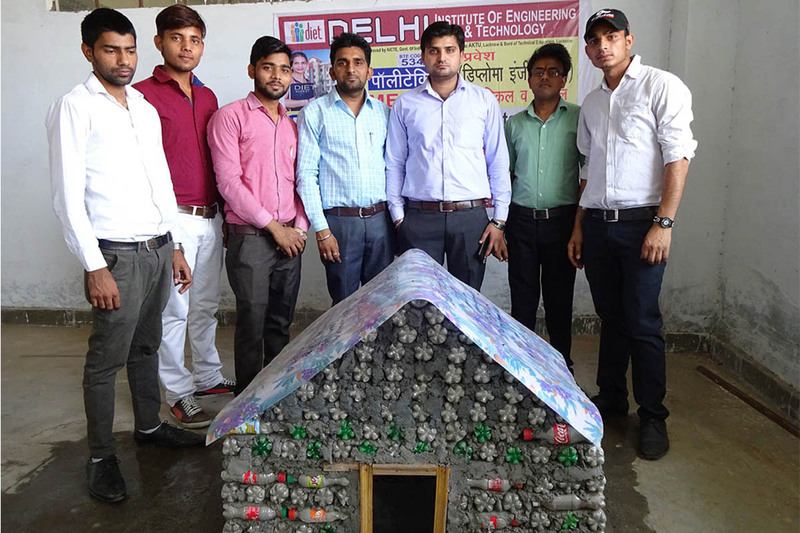 Strength of bottle bricks has been doubted by the public since they are made from plastic bottles. However, this doubt is solved because bottle bricks are stronger than common bricks and they are bullet proof. In a small village in Nigeria, a solution has been applied to not only provide shelter in a poverty stricken country, but find a use for refuse. Packing sand into plastic bottles is a technique that started nine years ago in India, South and Central America. Named “bottle brick” technology, the compacted sand inside the bottles is almost 20 times stronger than bricks. Adding to the appeal of the simple technology, the houses are ideal for the hot Indian climate because the bottle bricks buffer the house from the intense heat. This project was done as part of our college activity.